Roll! Shells fly overhead as night-scopes capture deadly fire fights with an eerie green hue, a category 5 hurricane devastates the Big Easy, hidden cameras enter a Cambodian village of brothels and a veteran journalist interviews himself throughout his own brain surgery. Part non-fiction drama, part trade publication, part text book, all woven together giving the reader a look through the viewfinders of the very best television photojournalists. As 19 experts weigh in with their candid, personal stories and photographic tips, it's as if you're over their shoulders, following their intuitions and hearing their thoughts as they shoot. The trade term for what they do is called ENG (Electronic News Gathering) and whether they're called Cameramen, Backpack Journalists, Television Photographers or any other moniker de jour, they're all paid to bring the world's events into living rooms around the world. These are the men and women who capture the bleeding edge of history - as it happens. 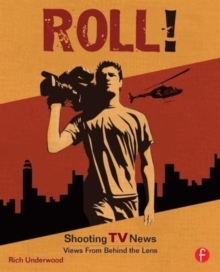 Written in a smooth, unique interview style, this book is a necessary read for photojournalists, videographers and tv photojournalists.